I am ready to be done with my education. In fact, I’ve been ready for many years now. 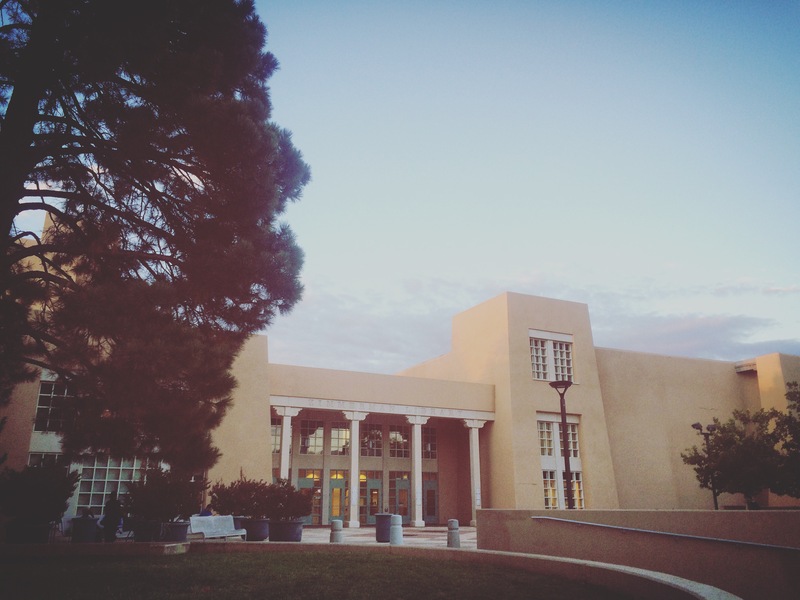 But in these last few years that itch to be done, has been amplified by my time at UNM. From the beginning I have had many issues with the University. From advisers who were so cruel they made me cry, the bureaucracy, the lack of empathy, and the idea that someone else can take care of it because this is not my department. The only thing positive to say about UNM is that I was able to live the most wonderful year in Scotland. However, that is where my journey with frustrations toward UNM really began. Before leaving I was told I had to go to each department (ie Biology, Economics, Sociology etc.) to make sure the courses I was taking in Scotland would be transferable to a course that would count toward my degree back home. So I had to figure out who to talk, to most of the time never getting a clear answer. I was finally able to reach all the departments except one- Biology. It was coming down to the wire. I had to have these courses before they would accept me and the deadline was coming. It got to the point that a representative on my behalf also had to contact the department. Finally on the day needed I got the okay from the department. After my year abroad I got around to getting my classes transferred back. It was a difficult process that took time, but eventually all the departments except… you guessed it… Biology got back to me. I was able to get the classes to count and move forward. Going into my last semester I was still having a hard time hearing from Biology. I emailed one person… well they don’t work for the department anymore email this person… emailed that person and they never respond to the email… ok try this person a couple responses then you need to email this person… email that person and… you get the picture. For a year I had this battle with the department. This was just to figure out who to talk to not even actually getting the class transferred. Finally in my frustration I gave up. I’ll chose to retake those classes here at UNM. It was my last semester so I needed to get the credits to graduate. However, sitting in the two classes on the first week of my last semester I started to get angry. How is it that I had the okay and yet because of the bureaucracy and the complacency that is shown at UNM again my own money was going forward to these classes. So in an act of desperation I went in person to the Biology department. They had walk in hours and when I got there they still had the sign in open. Well not too much later one of the ladies comes out and turns it off saying there weren’t taking any more after that. Then another while later she comes out and says we may not be able to see everyone that signed in. So I again waited. I mean all I have is one question… who do I talk to? Also if you allowed people to sign in you need to honor that. Well five minutes til the same lady comes out very rudely to myself and one other girl, ‘Why are you still here? You better not still be waiting! I told you we wouldn’t be seeing everyone!’ Very bravely I went up to her and asked I have the simplest of questions ma’am. Her response well it better be. ‘Who do I talk to about transferring a grade back from an international university? She looks at me and says you didn’t have to come in person for that. Yes ma’am actually I did because I have not gotten a response from the department and I have been back for two years now.’ Finally, with a little encouragement, she heard what I’ve been dealing with, and told me to email her and be as detailed as possible about it all. Also that she would send it to her supervisor. So I went home and dug up email after email of no response and lack of communication. Finally, I received an email from another person who then started to work with me. But once more week later and three of my own emails later there was no response. All the while I am still going to classes because I don’t know if I can drop them yet. The deadline to drop classes is coming up in a few days and still no word. Finally, one more time, I went in. Another man was there this time and he said ‘why were you dealing with that person? I am the one who does these things. We need to start from scratch…I need all this information.’ I was so frustrated at this point how is this even possible? No sir, I have emails saying this class would be approved… I need to drop this class in a few days… Please can you just except this? I forwarded him the email and finally got the approval from him and he said I had his word he would take care of it go ahead and drop the classes. Some time goes by and I check in to see and he said he is now waiting for a response and would let me know when he heard back. On a side note I recently applied to the college program. I was informed by the director of my program there was not a time limit on applying just as long as I did it before I graduated. So as any normal person, I put it off. If it didn’t need to get done then why do it? On the very first day of my last semester though I turned it in. Waiting a month and checking in on it a couple times with issues there (I am pretty sure everything you do through UNM whether big or small results in issues). As well a class I was told to take in the summer for a specific section of my degree was not showing up as fulfilling that credit. So I went to talk to records about it and the lady was very nice, but there was very little she could do from her department and while I was there I asked her about the biology class and she emailed another department who said they haven’t received anything. So now I was back to square one and needing to go talk to more departments. I received my acceptance into the program about a day or two later and I looked up my records which now showed that I was missing more classes. So I went back to the program to set up an appointment and emailed the director. I had also contacted another department about the biology situation to which they were rude and extremely unhelpful telling me ‘we don’t deal with that here I don’t know why they sent you here.’ Afterwards I went to the other department to try once more to figure out the Biology situation. This time in my records it showed the class, but still not counting toward a credit. I walked into an office and began telling them what was going on and the lady asked me when did you expect to graduate I said this semester and she replied you are not on track to graduate this semester. Honestly, I just started crying. She told me that my degree no longer exists so they changed me to the closest concentration to it, and I was now missing classes. Also I was supposed to have applied to the program a long time ago because I need to have been accumulating time in that program. So I won’t be able to graduate til the spring. I was so upset at this point. How did no one in my entire time at UNM tell me this? You have to see an adviser every semester, and each time they failed to mention these two things to me? How did they miss the fact that my degree no longer exist? Not only that, but last semester I asked to meet with the director of my specific program directly to ensure I was taking all the right classes this semester in order to graduate. To which he told me I was fine. How is this possible? I am now taking four classes one of which is fluff class I could have easily taken the missing credits this semester. It wasn’t as though I was trying to avoid the classes or just being lazy. Why am I being penalized for something I had no control over and the lack of care on behalf of the department. So now I needed to email more people… talk to more people and was warned they probably won’t be able to do anything about the classes. Now let’s just remember that I am done with school and at this point I can truly say I really very much so dislike UNM. I have been telling myself just two more months… I have also been looking and making plans for my future. Things I can only do once I am down with university. One next step in particular I have been getting my heart set on and all of this would change it. I was so discouraged at this point. So I went to Facebook after a long teary conversation with my Mom and asked for prayer. Prayer that God would move the mountain in front of me. Prayer that God would direct my future and hold my plans and prayer that someone… the right one.. would show favor on my behalf. So I sat down and sent a long email to a girl in the program who I was told may be able to help me. I was also told that I was not the first student to have been lead wrong in this particular department and the director was being let go because of it. I was so worried it was going to have taken weeks to resolve… I would had to fight my cause… go to the dean.. go to more faculty… go to the top and having something that could potentially get very ugly. But I truly believe through the power of prayer and by God’s grace the woman I emailed took favor on me and completely changed the situation around. She not only got my biology class on track, she updated my degree back to the original one and guaranteed that I was now officially on the list to graduated, and to keep the appointment I had previously made to sign off on my grad check. I cried once more tears of joy. I was so overwhelmed with feelings and gratitude. So if you happened to have prayed for me THANK YOU!!! Not only for this situation, but I believe it was spiritual warfare to discourage me about the plans I believe God is helping me build for after college. This may not have seemed like the impossible mountain to some, but when you’ve been working as many hours as possible, also required by a class to complete 120 hours of volunteer in the semester, taking other classes and trying to sleep occasionally it felt that way to me. Let’s just say I am very ready to end this year and excited for 2016! I am so sorry for the roller coaster, but in the midst of the ups and downs and sideways jolts and bumps, you’ve been able to see God at work in your life on your behalf many times and those I believe are eternally valuable, beyond measure! I am proud of you for all your hard work. May 2016 be a year of great things! So very true! Thank you for the constant encouragement and riding up and down with me! Love you!